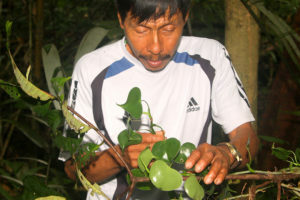 Lucho examines another tropical plant used for medicinal properties known only to Matsés shamans. Lucho lives with his wife Marina in the Matsés village of Estirón. He is a meticulous worker and it shows in everything he does. Lucho is renowned as a great healer among the Matsés. People often travel great distances to Estirón to receive his treatments. Detail of Lucho’s handiwork. 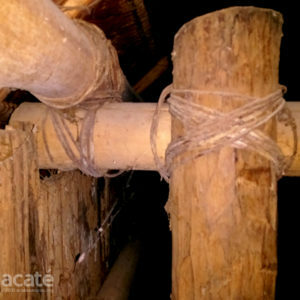 Using only chambira or tambishe (fibers sourced from the jungle) the Matsés are able to build strong, durable structures. 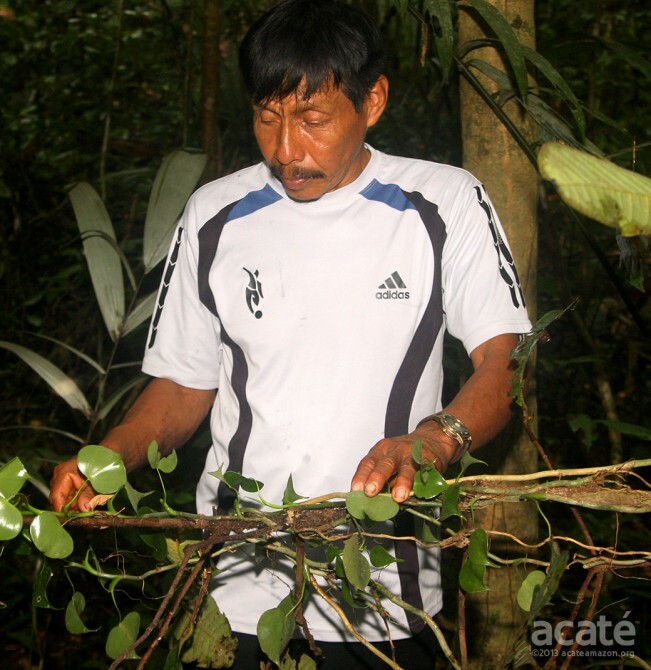 Lucho was the principle author of Acaté Amazon Conservation’s first chapter of the Matsés medicine encyclopedia, which is being used as a model by the other plant masters working on the project. Lucho’s grandmother, a mestiza, was captured when she was pregnant with his father Manuel. Years later, in around 1948, Manuel captured Lucho’s mother from the Kulima tribe. Dsi, Lucho’s mother, was not born a member of the Kulina tribe; they had captured her from the Demushbo as a young girl. As a boy, Lucho earned the respect of the elders by successfully hunting Wooly Monkeys. They are extremely wary of humans and stay high up in the forest canopy making them extremely difficult to hit with an arrow. During his time hunting he also became very interested in medicinal plants and learned all he could from the elders. Lucho is still one of the best hunters in his community and rarely comes back home empty handed. He enjoys telling stories about his adventures in the jungle and being present at the first peaceful contact with the outside world. 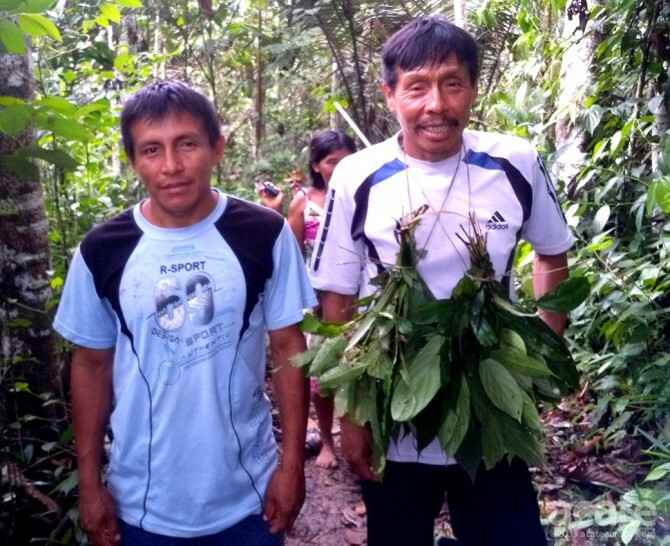 Lucho is currently teaching his son the tribal knowledge of plant medicine. Lucho collecting vines for medicinal preparation. Lucho spends his days hunting, farming and preparing medicines for his friends and family. He also spends a lot of time teaching his children all the skills they will need to thrive in the jungle. 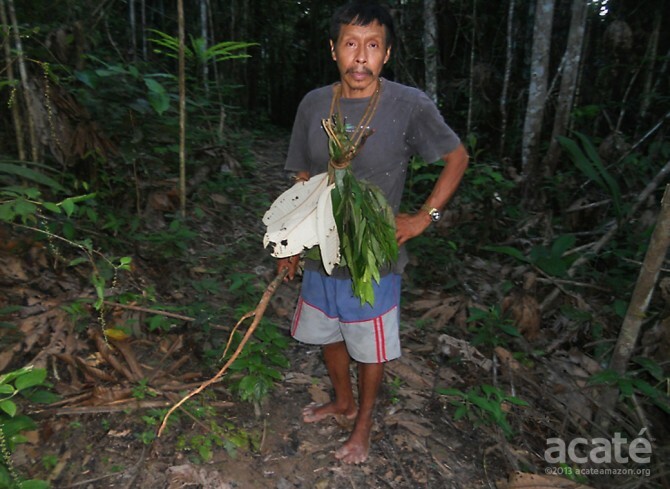 *There have been 3 fatal jaguar attacks on Matsés since the 1970s. Lucho on the trail collecting plants.